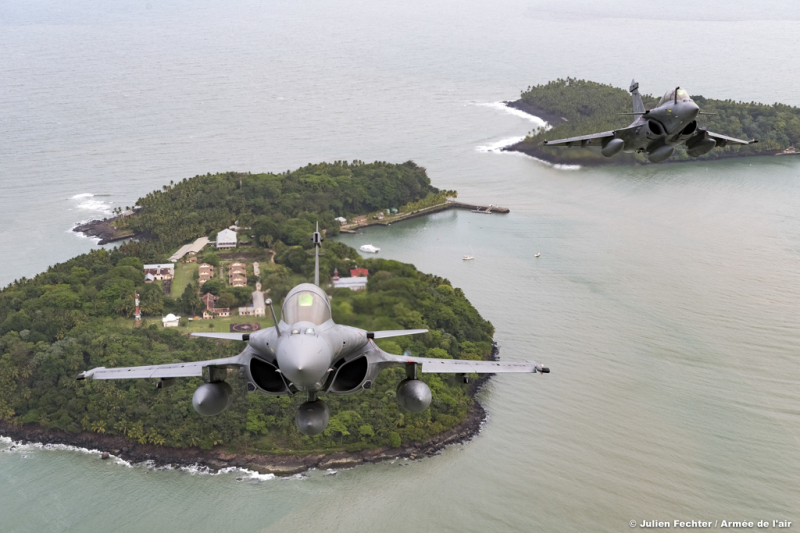 Two Rafale, a C135 tanker aircraft and an E-3F AWACS radar aircraft are currently deployed to French Guiana for the launch of the CSO satellite. The Air Force plays an important role in the protection of the Guiana Space Center. On the occasion of the launch of the first military observation satellite CSO (Optical Space Component) on December 18, the permanent protection operation of the Guiana Space Center, named Titan, will be raised to its maximum level. In this context, the Air Force sets up a special air security system of exceptional size code-named Bubo. Indeed, “the launch of a military-oriented space system gives the launch a special sensitivity that needs to be protected. Two Rafale fighters from Squadron 2/4 "Lafayette", a Boeing C135 from Sqn 2/91 "Brittany" and an E-3F AWACS aircraft from the 36th Airborne Command and Control Wing have made the trip from Europe,” explains Colonel Frédéric Chiffot, commander of the Cayenne-Rochambeau Air Base 367 and Head Air Defense Authority (HADA). Along with two Fennec helicopters from Transport Squadron 68 "Guyane-Antilles," they will ensure that no aircraft enters the airspace of the Guiana Space Center. While the fighter planes will provide a warning in flight, the C135 will ensure their endurance on station. The E-3F will strengthen the surveillance and response capabilities in French Guiana. In all, nearly 115 airmen were called in as reinforcements, more than 7000 kilometers from Continental France.